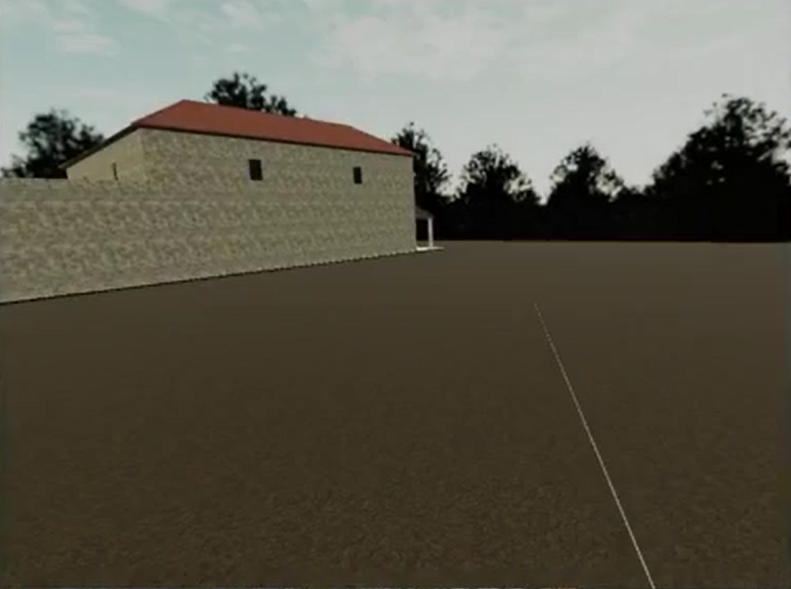 This VR project is an interactive visualization of the Poggio Civitate artifact data from OpenContext for participation in the Open Context and Carleton University Prize for Archaeological Visualization. UPDATE 1/31/2017 This project won first place for the 1st Open Context and Carleton University Prize for Archaeological Visualization! In this demonstration VR environment, artifacts are programmatically "buried" by the software underneath the ground according to the provenience data recorded in each object's OpenContext record. With the HTC Vive VR headset, users move around the environment by pressing down on the Vive controller trackpad, aiming the green teleporation target where they wish to go, and releasing the trackpad to teleport to the targeted location. 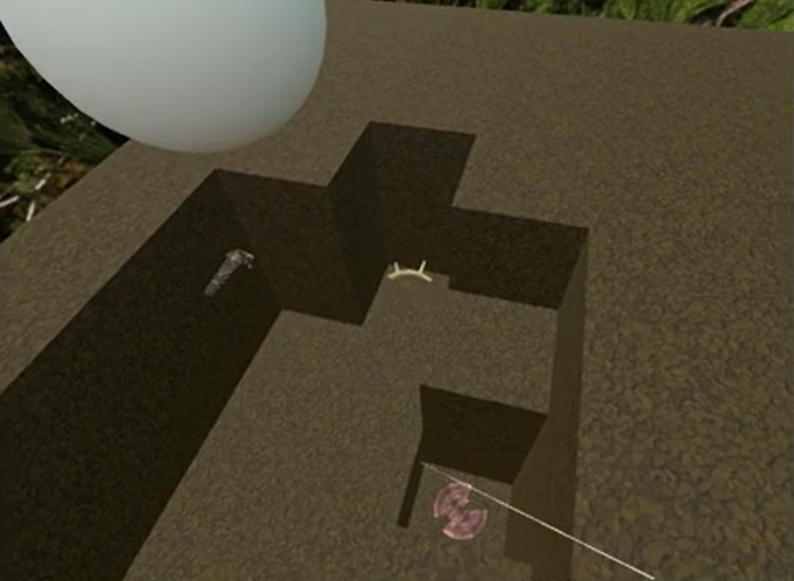 Users can excavate the terrain to search for artifacts by moving the Vive controller up and down over the ground surface in a digging motion. Once a user finds an artifact, they can view more detailed information by highlighting the artifact icon using the laser pointer and pulling the trigger button. The user points the laser pointer away from the artifact icon and pulls the trigger again to dismiss the detailed record information windows. To run the program, unzip the downloaded file and run "PoggioCivitate_VR_Viewer_20170115.exe"
Users can excavate the terrain to discover artifacts placed by the software according to their OpenContext records. Users can interact with the artifact icons to view more detailed information from OpenContext records. 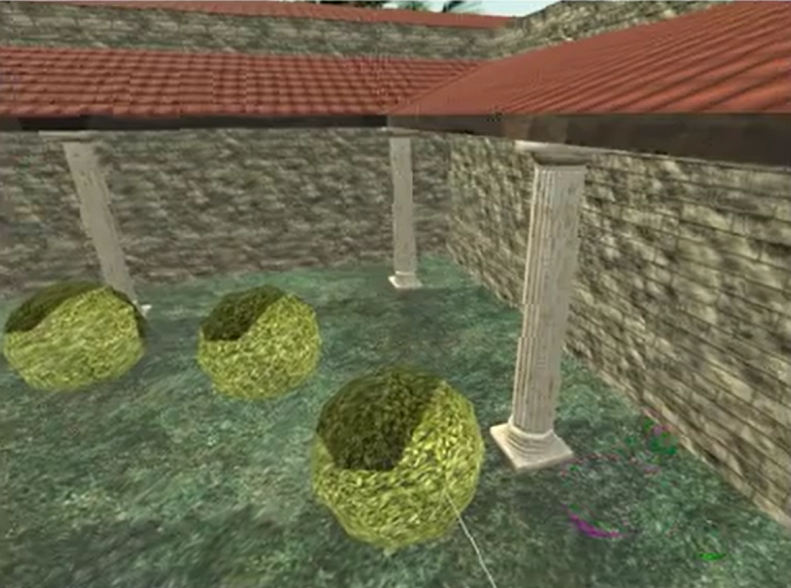 For this site, we added a model of a Roman villa as theming. This VR project was originally created for the 2016 SeattleVR Hackathon IV. Over the course of 48 hours, our team worked to download and parse the JSON data from the Poggio Civitate Excavation Project and visualize it within a VR environment. The data for the project were hosted on OpenContext.org. They contained lots of information about the excavated artifacts, as well as features. Because of the variety of the data, we might have been wiser to select just one artifact class to visualize. As it was, we had to heavily clean the data in order to standardize fields. This is an issue common to many archaeological projects and, in future, we'd advise that a careful survey of the data is necessary before beginning a visualization project. In the current version, a handful of the artifacts visualized in the scene can be found nearby the floating orbs. Initially, the team wanted to create a simulation of re-excavating the artifacts, which proved to be a complex task. For the time we had for the hackatahon, we created a system which generates a 3D icon for each artifact described in the OpenContext data. The system then "buries" each artifact icon within a 1x1 meter block and maps the block to X,Y,Z coordinates in VR that match each artifact's provenience data. To simulate digging, we modeled a Marshalltown trowel which appears when the user moves their Vive controller downward in a digging motion over a block. This action deletes the block and reveals a 3D modeled icon of a ceramic, lithic, bone, or other object based on the artifact's type.